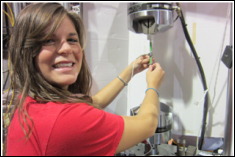 Erica Hocking is shown testing miniaturized pneumatic artificial muscles on the 20 kip MTS machine in the Composites Research (CORE) Lab. Erica Hocking, a graduate student in the University of Maryland?s Department of Aerospace Engineering, was awarded a prestigious National Defense Science and Engineering Graduate Fellowship to support three years of M.S. and Ph.D. research. Hocking earned her B.S. in Aerospace Engineering from the Georgia Institute of Technology, along with a minor in Materials Science and Engineering, graduating in 2010 with Highest Honors. As an undergraduate, she was awarded several competitive scholarships including Georgia Tech?s President?s Scholarship, the National Merit Scholarship, and the Northrup Grumman Engineering Scholarship. She was active in research as an undergraduate and co-authored a journal paper in Smart Materials and Structures on nano-magnetite reinforced shape memory polymer foam. Upon graduating from Georgia Tech, Hocking was offered the Minta Martin Fellowship from the Department of Aerospace Engineering to pursue her graduate studies at the University of Maryland. Accepting the award, she has been a graduate research assistant under Dr. Norman Wereley in the Smart Structures Laboratory since 2010. Her research has been on designing, fabricating, and characterizing fluidic artificial muscles with millimeter-scale diameter that are capable of being actuated using either air or water as the working fluid. She will continue to research these devices and their application under the support of the NDSEG Fellowship. Congratulations to Erica Hocking for receiving the NDSEG Fellowship!